Tara (Serbian Cyrillic: Тара, pronounced [târa]) is a mountain located in western Serbia. It is part of Dinaric Alps and stands at 1,000 to 1,590 m (3,280 to 5,220 ft) above sea level. The mountain's slopes are clad in dense forests with numerous high-altitude clearings and meadows, steep cliffs, deep ravines carved by the nearby Drina River and many karst, or limestone caves. The mountain is a popular tourist centre. Tara's national park encompasses a large part of the mountain. The highest peak is Zborište, at 1,544 m (5,066 ft). Tara National Park was established in 1981 and it encompasses Tara and part of the Zvijezda mountain, in a large bend of the Drina River. The area of the park originally was 191.75 km2 (74.04 sq mi) with altitudes varying from 250 to 1,591 m (820 to 5,220 ft) above sea level. 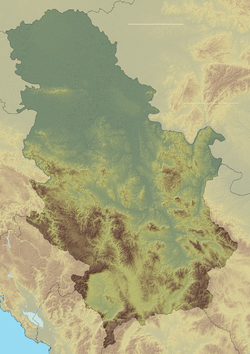 On 5 October 2015, the National Assembly of Serbia adopted the new law of national parks which enlarged the Tara National Park to 249.92 km2 (96.49 sq mi), by adding to it the protected area of "Zaovine Landscape of Outstanding Features". The park's management office is located in nearby Bajina Bašta. The protective zone of the park, which encircles it, is much larger and spreads over the area of 376 km2 (145 sq mi). The national park consists of a group of mountain peaks with deep picturesque gorges between them. The highest point of the park is the Kozji Rid peak on the Zvijezda mountain, with 1,591 m (5,220 ft). The most striking of these gorges is the Drina Gorge, with its sheer drops from 1,000 to 250 m (3,280 to 820 ft) and extensive views of western Serbia and nearby Bosnia. It also encompasses the gorges of the rivers Rača, Brusnica and Derventa and the waterfall of Veliki Skakavac on the river Beli Rzav. The area is also characterised by karst caves, pits, springs, and breathtaking vista points (Kićak, Smiljevac, Bilješke Stene, Kozje Stene, Vitimirovac and Kozji Rid). Forests account for three quarters of the national park's area, 160 km2 (62 sq mi), some of them being the best preserved and well-kept in Europe. With 83.5% of the territory under forest, Tara is the most forested area of Serbia and thus nicknamed the "lungs of Serbia". The forest growth is among the highest in Europe: the total wood mass increases each year and the quality of the forest is enhanced. Cutting of the wood is strictly controlled. Since 1960, the total measurement of the wood mass on Tara has been measured every 10 years. From 1990 to 2000, the mass grew from 463.7 m3/ha (5,325 US bushels per acre) to 476.4 m3/ha (5,471 US bushels per acre). Within the park, there are 9 reserves with an area of 29.5 km2 (11.4 sq mi), or 16% of the park, where woodcutting is forbidden. Some of the areas are left unattended for centuries, making them basically a temperate rainforest. Forests mainly consist of beech, spruce and fir. Tara also boasts a rare endemic Tertiary species, the Serbian Spruce (Picea omorika) which is now protected in the small area of the park. It was discovered by Josif Pančić in 1875 in the Zaovine's hamlet of Đurići. Because of its rarity and scientific importance, it has been placed under national protection as it can only be found on two locations on Tara: the canyon of the Mileševka river and on the Zvezda massif. Oldest trees in the park are the beeches, and in total there are 1,200 plant species in the park, of which 84 are Balkans endemites, and 600 species of fungi. There are two species of edelweiss which can be found in Serbia only on the Tara. Pančić discovered the Derventa knapweed (Centaurea derventana) on the cliffs of the Derventa canyon, while Alpine edelweiss habitats only one ridge on Mokra Gora and is strictly protected. Another endemite is common lady's mantle. There are total of 140 insect species in the park. Rare species include Pančić's grasshopper (Pyrgomorphella serbica), endemic cricket Balkan isophya discovered in 1882 by Carl Brunner von Wattenwyl and aspen longhorn beetle, which in Serbia lives only on this location. 135 bird species make their temporary or permanent homes on the slopes of the mountain, including golden eagle, griffon vulture, peregrine falcon, Eurasian eagle owl and black grouse. On Perućac lake on the Drina, there is a population of common merganser, with 50 pairs. Tara is inhabited by 53 mammalian species, including the protected brown bear and otter, as well as chamois, roe deer, lynx, wolf, jackal, wild boar and marten. Since they have been fully protected, numbers of brown bears soon began to rise. By 2018, there were over 50, which is considered to be the optimal number of animals on the mountain. As their number grew, despite having feeders they began causing damage to local orchards and apiaries, but have not attacked livestock nor the villagers. Some of the animals are tracked via satellite. The tracking shows that females, especially with cubs, occupy a compact area, but males range more widely travelling west, crossing the Drina into Bosnia where hunting is permitted. The bears do not tend to travel into central Serbia, to the east or northeast of the mountain, but the first animal which was tracked used to go all the way to the slopes of the Kopaonik mountain, in the southeast. Work published in May 2018 in the Proceedings of the National Academy of Sciences of the United States of America journal by the research team from the Northumbria University revealed that the locality "Crveni Tepih" shows the evidence of the oldest lead pollution in Europe. It is dated to 3600 BC, predating the previous oldest findings dated to 3000 BC in southern Spain and pushed back the origins of lead metallurgy for six centuries. Kremenilo, near the village of Višesava, is a prehistoric settlement, dated between 5,000 and 7,000 BC, as part of the Starčevo culture which developed in Podunavlje as the first agricultural culture in the Balkans. Mountainous Illyrian tribe of Autariatae inhabited the area during the Bronze Age. Though it is often mentioned that tara means "star" in Sanskrit, name of the mountain is derived from the name of the tribe. On the locality of "Borovo Brdo" near Kaluđerske Bare, a Slavic pottery from the 6th and 7th century was found. The medieval necropolis of Mramorje is located near the village of Perućac. As one of the most important stećci complex in Serbia, it has been protected by the state as a Cultural Monument of Exceptional Importance. Another such necropolis is near the village of Rastište. During the Ottoman period, a "Bosnian road" passed through the area. The hamlet of Gradina, near Kremna, was the location of a Turkish arsenal and a caravanserai. They were destroyed by the Austrians in 1738. Due to the heavy forestation, during the Ottoman rule Tara was the hiding place for the hajduks. For a period of time, Tara was an important railway crossroad. Exhibits from that period are kept in the Railway Park "Bela Voda" [sr], near the spring of the same name. They include the "maginot railway wagon" for the ammunition transport during the World War I or the German locomotive from 1928. There is also a Railway Museum in Mokra Gora, in the building constructed in 1916 by the Austro‑Hungarians when they were building the narrow gauge railway in occupied Serbia. Known today as the Šargan Eight, it is a heritage railway and a major tourist attraction. Lake Zaovine in March 2017. The main tourist points are Kaluđerske Bare on the north, close to Bajina Bašta, and Mitrovac on the south. Hotels Beli Bor and Omorika, as well as several smaller ones, are located on Kaluđerske Bare, while Mitrovac hosts eponymous children's recreation hotel. The National Park can be reached from Bajina Bašta directly (by the Bajina Bašta - Kaluđerske Bare road), from Perućac via Bajina Bašta (by the Perućac - Mitrovac road) and from Kremna (the Kremna - Kaluđerske Bare road). The Drina gorge, which is an integral part of the park, can be toured by boat. Interesting locally made items are woolen handcrafts, various dairy products, juniper and plum spirits and honey, particularly Pine honey. The Rača monastery is a Serbian Orthodox monastery built by king Stefan Dragutin (1276-1282) on the right bank of the Rača river. Three centuries later, a famous scriptorium, known as the School of Rača (Serbian: Рачанска школа, translit. Račanska škola) developed and flourished in the 16th and 17th century. The monks translated texts from Ancient Greek, wrote histories, and copied manuscripts. They translated and copied not only liturgical but scientific and literary works of the period so the history of Serbian literature is owing a lot to it. Turkish travel writer, Evliya Çelebi noted in his travelogue of 1630 that in Rača Monastery there were 300 monk scribes, who were served by 400 shepherds, blacksmiths, and other staff. The security guard included 200 armed men. It was damaged several times during the Ottoman period. During the Great Turkish War the monastery was partially destroyed by the invading Turks in 1689. In 1826 it was reconstructed due to being burned down several times. Gendarmerie lieutenant colonel Jaraković handed over the Miroslav Gospel to hegumen Platon Milojević in 1941, who kept it during the war. The Rača monastery is declared a cultural monument. There are houses on the mountain, representatives of the folk architecture. House of Vukajlović is one of the oldest, built in the middle of the 19th century. It was constructed by Vitor Vukajlović, a meyhane owner from Bajina Bašta. House is not residential anymore and is turned into the tourist facility. It is noted for the writing near the entry doors "Slaviša, with his Mrs. Ana, lodged here in 1905", which is today considered as the oldest date when the tourism on Tara began to develop. Also, there are over 650 shepherd's huts scattered over the mountain, the oldest being from the 1700s. Earlier, there were also specific log cabins, called kućer. Instead on the foundations, they were built on the sledge-type pedestals, so they could be easily moved by the yokes or teams. A mini hydro was constructed in 1927 on the Vrelo river. It became operational in 1928, powering Bajina Bašta, Perućac and Kaluđerske Bare. The Vrelo is considered the shortest river in Serbia, being only 365 m (1,198 ft) long, which is why it has been nicknamed the "Year". It ends with another attraction, a 8-metre-high (26 ft) waterfall into the Drina, with a lookout and a restaurant above it. This section of the Drina is a starting point of the Drina Regatta, an annual event which grew into the major tourist attraction as in July 2017 it was attended by 1,500 vessels with 20,000 people on the boats and 120,000 visitors in total. ^ a b c B.Pejović (13 July 2008). ""Pluća Srbije" sve jača" (in Serbian). Politika. ^ a b "About Tara NP". National Park Tara. 2013. ^ a b c "Nacionalni park Tara – položaj, proglašenje nacionalnog parka i zone zaštite" (in Serbian). Geografija.rs. 25 February 2014. ^ "Zakon o nacionalnim parkovima (National parks law)" (in Serbian). 5 October 2015. ^ "Usvojen Zakon o nacionalnim parkovima" (in Serbian). Institute for nature conservation of Serbia. October 2015. ^ "Proširen Nacionalni park "Tara"" (in Serbian). Turizam & Ugostiteljstvo. 13 October 2015. ^ Slavica Stuparušić (19 January 2018). "Зими је лакше са медведима" [In winter is easier to deal with bears]. Politika (in Serbian). p. 08. ^ Jovana Nikolić (16 June 2018). "Počeci metalurgije na Balkanu" [Origins of metallurgy in the Balkans]. Politika-Kulturni dodatak (in Serbian). p. 09. ^ "Earliest European evidence of lead pollution uncovered in the Balkans". Northumbria University. 29 May 2018. Wikimedia Commons has media related to Tara Mountain. This page was last edited on 6 April 2019, at 11:04 (UTC).